What if The Hunger Games were a Disney movie? What would The Hunger Games look like if Disney got its big white mitts on the franchise? How would all of the kiddie blood look if it had been line-animated? The internet is full of fan art depicting Suzanne Collins' dystopian world transformed into a Disney cartoon, and we've rounded up our favorites. 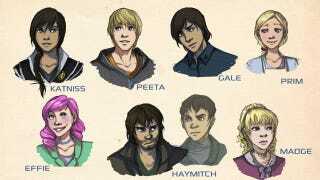 Including Peeta as a Disney Prince!